Just returned from Dubuque where Kathie and I attended the 2015 Midwest Fire Conference: "Keeping Fire Working for the Land". This was organized by the Tallgrass Prairie and Oak Savanna Fire Consortium (TPOS) and was a multi-state affair, with over 330 attendees and 60 speakers. Naturally, Iowa was the state with most attendees, but there were lots from Wisconsin and Illinois, and a smattering from Indiana, Minnesota, Michigan, Ohio, Nebraska, and Missouri. See the map below and the TPOS website for details. You should be able to see the abstracts and some of the recorded presentations in a few days on the TPOS web site. Here I am listing some of the sessions that I attended. A major highlight was the Plenary paper by Bill Kleiman and Cody Considine of The Nature Conservancy summarizing 25 years of fire at Nachusa Grasslands. Nachusa is a very impressive large restoration, especially since almost all the work there, including burns, is done by volunteers. See the Nachusa website at this link. In addition to the program, it was especially nice to see so many friends, not only from Wisconsin, but from other states. Kathie and I have been burning long enough now that we are getting to know a lot of folks in the "fire community". Our goal at Pleasant Valley Conservancy is to ensure the long-term survival of one of the most endangered habitats on the earth, the oak savanna. Many of the bur oaks here are well over 200 years old, and the oldest bur oak measured here is 278 years old, which means it started life in 1736 (the rein of George II). 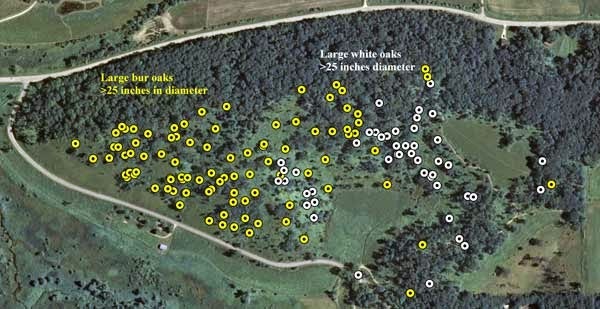 Although our large white oaks are not as old, they probably started life in the mid 1850s. You can’t create an object like this, you have to find it and care for it. These are important trees, well worth spending money on. Pleasant Valley Conservancy owns 104 bur oaks that are probably more than 200 years old! Although these big oaks once had a fairly favorable time of it, since the 1950s when the savanna/prairie fires ended, they have had a serious struggle. Fortunately, we came along in 1995 and with the encouragement of Brian Pruka, Paul West, Pat Schrader, and many stalwarts from the Prairie Enthusiasts and the Wisconsin DNR, we have been able to bring this small piece of oak savanna back to life. We’ve been burning our savannas since they were first cleared in 1999. Our files are quite complete and according to our records, as soon as a savanna unit was cleared, we burned it (or attempted to burn it). These were annual burns, either spring or fall. Originally, the savannas did not burn well, and lots of interior lighting was necessary. Why didn’t they burn well? It took some years for the understory vegetation, which provides a lot of the fuel, to get established. Although oak leaves, the other fuel source, were present, there was lots of downed timber, thus blocking movement of fire. However, we kept at it, doing lots of interior lighting, and annual seeding. With increased light the understory vegetation got better, the continued burns kept brush from getting started again, and gradually the burns got better. Now, 15 years later, our savannas are in great shape. Even so, we cannot let up our guard. In the savannas there is still a significant legacy of woody vegetation. What would happen if we stopped annual burns? Unfortunately, we know what would happen. Brambles, buckthorn, honeysuckle, sumac, prickly ash, and others would gradually return. We might be able to control it if we switched to a two- or three-year burn cycle, but all we would need would be to miss a year and have a four-year burn cycle and we would lose control. There are lots of publications in the literature on this. Also, legacy effects are lots more significant with savannas than with prairies. The term “sustainable” is fashionable right now. Mostly it is used with monetary value, but it seems to me it also has an important other meaning in conservation. Our burn season starts on March 15 and continues to the end of April. 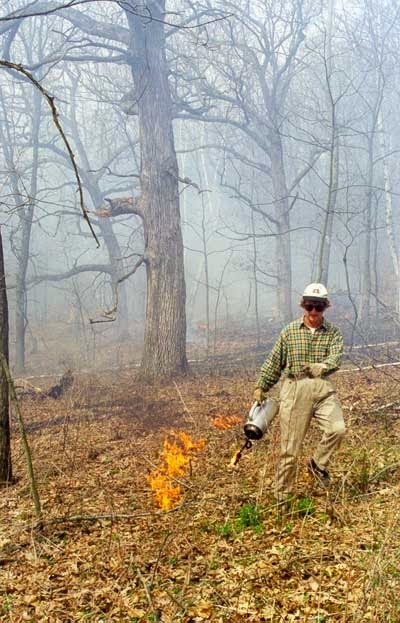 Savanna burns are interesting to do, and you have the joy of knowing you are helping some important veteran oaks. In addition, you are preparing the field for future generations of oaks!